White sugar is something that almost all of us consume everyday, whether we do it intentionally, or it is in the prepackaged food we are eating. Although there are plenty of forms of sweeteners in both our packaged food choices and simply packaged for us to buy, I only wanted to mention plain old white sugar today. Do you know that plain white sugar can be made from three different sources? I am pretty sure that everyone is familiar with cane sugar. This is made from from sugar cane. It is fascinating to me that something that basically looks like a stick could give us something so sweet. I grew up thinking that all sugar came from cane. I was amused when I found out it wasn't. 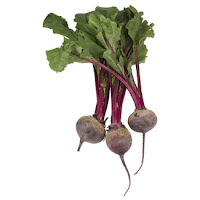 Do you know that white sugar can come from beets? This is the one I find most amusing! How can something so pure and white come from a red root grown in the ground? Now I know that root vegetables are among the sweetest, and hold the highest sugar content making them act like a starch in our body rather than a vegetable. Nice to know when juicing.. adding a root vegetable can make a very sweet drink! And my least favorite, do you realize that not just HFCS (High Fructose Corn Syrup) is made from GM (Genetically Modified) corn, but it is also the most commonly used sugar in the industry? It makes sense that it is used in various forms as a sugar, since it acts like a sugar in our body. Corn is really not the vegetable you were taught it was! While we may have a greater chance of being aware of whether our corn on the cob was genetically modified, there are no restrictions for labeling it on any food. How often do you eat something, or serve it to your family, that has sugar in it? Do you know what kind of sugar was used? Do you know if it was genetically modified? Wouldn't you like to know? To me, this is just another way that our freedom is being taken away, one cell at a time.. so small we don't notice it. Personally, I would like a choice on whether to eat genetically modified food, a choice on what type of sugar I consume, a choice on whether my food is raw or cooked when I eat it, and a choice on how it was cooked and when.. what about you? My husband and I just decided that we needed to seriously cut out the amount of sugar we eat. We were also shocked by how much sugar is in everything. It's been fairly easy for us, but I've had such a hard time changing food choices for my little ones. They want their fruit snacks, juice and yogurt. All of which contain a day's servings of sugar or more. Yeesh!